In case you have forgotten here's a few Conservative attacks on Canada's veterans: pensions killed, benefits clawed, killed lifetime pensions for Afghanistan veterans, and failed to spend $1.13 billion of the Veterans Affairs budget but found money to increase advertising and ceremonies for politicians to honour veterans. 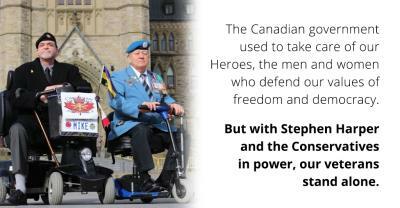 "The Harper Conservatives spent taxpayers' dollars to deny a vet compensation for losing his legs and testicles.” said Mike Blais, a volunteer at 'Anyone But Conservatives' adding, "Despite numerous reports of service failures and lack of support for veterans, the Harper government shut down nine Veterans Affairs offices to save $3.78 million and the same year increased its advertising budget by more than $4 million to buy playoff hockey ads." A fast growing group of veterans who disagree with Harper's policies is rallying under the banner - "Anyone But Conservatives -- Canadian Veterans Campaign 2015." 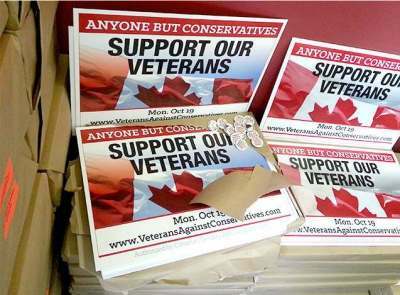 - a group, of veterans and supporters, who are asking all Canadians to support their campaign -- Anyone But Conservatives -- and on Oct. 19 vote to defeat Harper's Conservative government.The organization is asking Canadians to vote for any alternative to the current government. The Veterans ABC campaign is, according to Insights West working. In their piece 'Poll Shows Treatment of Vets Could Hurt Tory Base' which found one-third of Conservative voters are considering other party and the treatment of veterans is the biggest issue. The new book, 'A Dirty Little Skirmish', launched on Sept. 1 in Halifax, former army sergeant David MacLeod and writer Harold Leduc which charts the battle veterans must wage to access needed benefits and services from a government in denial, as former soldiers endure waiting lists for medical care and injury claims turned down by Veterans Affairs Canada (VAC), won't help Conservative fortunes a bit. MacLeod is just one of many angry vetreans who are rallying under the banner of the Anyone But Conservative (ABC) Veterans Campaign 2015. Another volunteer, Susan Clarke-Tizzard, a logistics corporal attached to the search-and-rescue team is speaking publicly about her PTSD for the first time, driven by a duty to help her comrades who are struggling with the after-effects of war and yet ignored by the Harper government, driving her to volunteer with ABC. The results of the Oct.19th election could be determined by these deserving people who are determined to receive the justice they've earned.